Oh, it surely isn't perfect – take a boo at the typical Lexus "alien predator" grille that, in this instance, looks like it's made out of whalebone corset thingies from days gone by, as well as the damn trackpad with which Lexus insists on saddling too many of its vehicles. On the upside, in an era in which Lexus, parent Toyota, and most other Japanese marques are over styling their models, the ES remains elegantly sleek and simple, and I like that. A lot. In fact, while I thought the generation this brand new 2019 model replaces was a great-looking car, this one is better. I realize beauty is in the eye of the keyholder, and that I'm often a lone voice barking in the wilderness, but I love this more subtle approach than the swoopy and/or angular and in your face designs that seem more common these days from the Land of the Rising Sun. Even better, the inside of the car is just as great! Lexus Canada says the 2019 ES 350's V6 has been upgraded, and it now offers 302 horses, up from the 268 of the last ES 350 I drove a couple of years ago. It's plenty, even with my lead foot; besides, I'd wager the target audience for this car is more interested in its comfort and convenience – and longevity – than its oomph. But if oomph's your thing, you should find the new ES just fine – especially when you access its pretty decent sport mode, which doesn't up the oomph ante but which does make the car feel more spry than in its normal or eco modes. If oomph isn't your thing (though remember, oomph is handy if you're passing someone) and you'd rather have a gas-sipping, Gaia-pleasing version, Lexus also offers the ES 300h, a hybrid version. That one is rated at "215 (160) Tentative Net HP," though its torque is probably more than adequate thanks to the electrification. The hybrid starts at $47,000 CAD, two grand more than the base gas-only version, but it also is claimed to get about twice the gas mileage than the gas-only version, which might be an important consideration for would-be purchasers. And this time out, there's also a "first ever" F-Sport version of the ES, though it's more of a gentle push of performance than a real sport version – basically an enhanced trim level with a couple of nice performance tweaks. However you configure the ES, it gets its power to the front wheels (and only the front wheels) via an all-new, eight-speed Direct Shift automatic transmission. It's a peach, too, shifting as it should (including in Sport mode), and it comes with paddle shifters. Add a tweaked suspension to the mix and you have what Lexus, quite correctly, says is "engineered for drivers," something that hasn't always been part of the mix. And it's true. I prefer a sporty drive and over the versions of the ES that I've driven it has gotten progressively better – and this version is definitely the best of 'em. Sure, it's no S4, but it doesn't claim to be. Lexus has mounted the drive mode switch up on the right side of the instrument binnacle (the traction control on/off switch is on the left), in a move they say was inspired by the LFA supercar, though I remember a 1983 Toyota Supra I owned for some 20 years that mounted its cruise control controls the same way. Wherever the inspiration came, it's pretty cool. 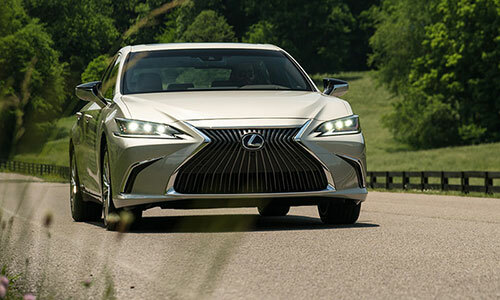 All of the new ES models are built on Lexus' Global Architecture platform, which the company says let its engineers boost handling significantly, as well as refining further the sedan's legendary quiet and comfortable ride. Speaking of quiet, Lexus really does a great job at fighting noise, vibration and harshness (NVH), and the new ES is no different. It glides across the asphalt almost as if it's a hovercraft and even ancillary potentially noisy things, such as the windshield wipers, glide through their jobs almost as if they aren't there at all – no squeaking no whoosh, nothing. This makes cranking the audio system even more rewarding! Lexus Canada's sample ES 350 came with the upgraded Martin Logan audio system, and it's a lovely thing to hear. It cranks well, offering thundering sound when you want it. The base system is a Pioneer, and it's probably fine, but I loved the upgraded one. Every new ES also comes with new standard technologies, such as the addition of Apple CarPlay to its Entune 3.0 connectivity system. The ES also introduces Lexus Safety System + 2.0, which they say is a major upgrade to its safety equipment and includes automatic high beams, dynamic radar cruise control, a Pre-collision system with pedestrian and bicycle detection, lane tracing assist (LTA) and lane departure alert with steering assist and road edge detection. I could do without a lot of this stuff – lane keeping assist and the like especially – but as long as it's "shut-offable" (and it appears to be just so) I can live with it. I sure wouldn't pay extra for it, but the stuff is standard equipment here anyway, so I suppose it's a wash.
Fortunately, you get more useful stuff as well, such as a rear-view camera and cross traffic alert system, both of which are extremely handy, especially in parking lots. Lexus offers several models of this terrific sedan, with the base ES 350 (starting MSRP of $45,000), coming with the above-mentioned stuff as well as an all-digital instrument cluster (also inspired by the LFA supercar), a 10-speaker Display Audio system with eight-inch display, a seven-inch multi-information display, rain sensing wipers, fog lamps, and more. And, of course, you can upgrade it from there. The Premium Package (starting at $48,800) adds navigation, a heated steering wheel, 12.3-inch display audio system, blind spot monitor and rear cross traffic alert, and more. The Luxury Package (starting at $55,600) adds Triple LED headlights and an adaptive front lighting system, unique 18-inch alloy wheels, full leather seating, the QI wireless charging system for smart phones, and more. Stepping up farther, to the Ultra Luxury Package (starting at $59,500) gets you goodies such as 18-inch alloy wheels with noise-reduction tires, that lovely 17-speaker Mark Levinson Premium Audio system, a touch-free power back door, 10-inch head's-up display, Bird's Eye View Monitor safety system, and more. Hybrid version packages are much the same; just add a couple of grand to the non-hybrid price and you'll be pretty close. Then there are the two, more performance-oriented F SPORT packages. The first (F Sport 1) features the drive mode select system with S+ mode, adaptive variable suspension, Blind Spot Monitor and Rear Cross Traffic Alert safety systems, rain sensing wipers, a cute spoiler on its bum, active noise control, and more. You also get unique F SPORT detailing, including a three-spoke steering wheel, 19-inch alloy wheels, and Nuluxe seating material (which is probably a lot nicer than "Oldluxe seating material). The F SPORT 2 package (starting at $54,800) adds Navigation, 12.3-inch Display Audio system, the head's-up display, triple LED headlamps with the adaptive front lighting system, and more. O matter how you slice it, that's a lot of goodness, and the pricing seems pretty competitive to me: an entry level Audi A4 starts at a lower price point, but it's only a turbo four and by the time you add the stuff you can add to the ES 350 you're right in the same ball park. Ditto for Infiniti's Q50, which starts at $44,995 CAD. It has more horses ("up to 400") but the last one I drove (a couple of years ago) annoyed me so much with its nannies and driving tweaks that I couldn't wait to give it back (and I'm a former Infiniti owner!). Those are just two examples. Thanks to packages offered and the various configurations you can create it's hard to get a complete apples-to-apples comparison, but from poking around various car company sights the ES seems priced right where it should be. And as mentioned, it's also the nicest ES I've driven. On the other hand, I hate Lexus' track pad so much it just could be a deal breaker. I realize the centre stack-topping LCD is too far away to work as a practical touch screen, but a touch screen (in my never humble opinion) is the best compromise for controlling the abundance of features companies are stuffing into their vehicles these days. Trackpads, and to a lesser degree mice and knob thingies, require too much of the driver's attention to operate them. But all that aside, if you're looking for an "entry level" luxury sedan that offers lots of stuff and is even pretty compelling to drive, hie yourself on down to your local Lexus store and try out this new ES 350. It's a pretty darn nice drive.